TamTam Russia is a Moscow-based charity organization employing design as a tool to positively impact urban life in Russia. They are part of the international Tam Tam Network, established by four great Italian designers in 2012. 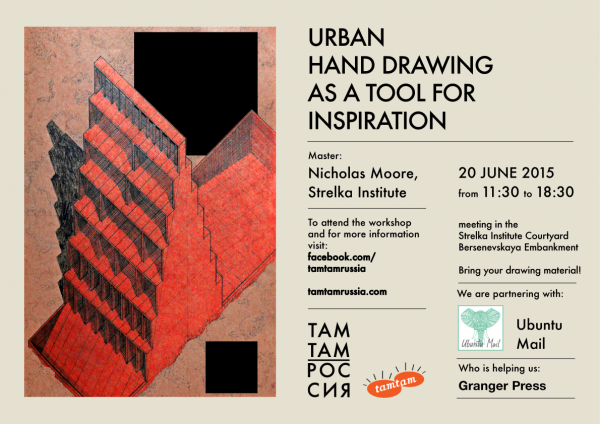 We are beyond excited to announce that we partnered up with TamTam Russia and will be presenting our project at the workshop “Urban hand drawing as a source of inspiration” run by Nicholas Moore from Strelka Institute. Come join us at Strelka Institute for Media, Architecture and Design. But keep in mind that all of the attendants will be expected to volunteer at the charity, “paying” back for the workshop with their personal time!